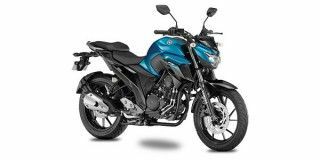 Yamaha FZ 25 price in Bangalore starts from Rs. 1.19 lakh (Ex-showroom). FZ 25 is available in only 2 variant. The top-end variant Yamaha FZ 25 ABS is priced at Rs. 1.33 lakh. Yamaha FZ 25's top competitors are Yamaha MT 15 (price starting at Rs. 1.36 lakh in Bangalore) and Bajaj Pulsar NS200 (price starting at Rs. 1.00 lakh in Bangalore). Share your experiences with FZ 25? Q. Is MT-15 value for money than FZ 25? Without any doubt, Yamaha FZ 25 is a value for money bike whereas if we talk about Yamaha MT15, this is a little bit costly and that cost doesn't justify the bike's features. Q. I own fz25 since april 2018 now i am getting only 27kmpl mileage only and rear wheel braking is so scary how to solve this issue when abs is launched can i retro fit on my bike. I own fz 25 in march 1, now milage is 38 km per leter. First time milage 27. After Third service milage will be increase. Q. Hello i am a college student. My pupose are mostly city duties ,commuting and sometimes long ride. Is the fz25 best for me or it will be ok to be stick with fzs?? After sale service?